Who would have thought to draw a portrait of a business? That's what Kelly Rae and Beth Nicholls asked us to do on the second day of Hello Soul Hello business class. I kind of let go just to see what came out, and here she is. I think her name is HeLaDi--Salish for "having things just right". I wasn't surprised that her power stick (spear? staff?) 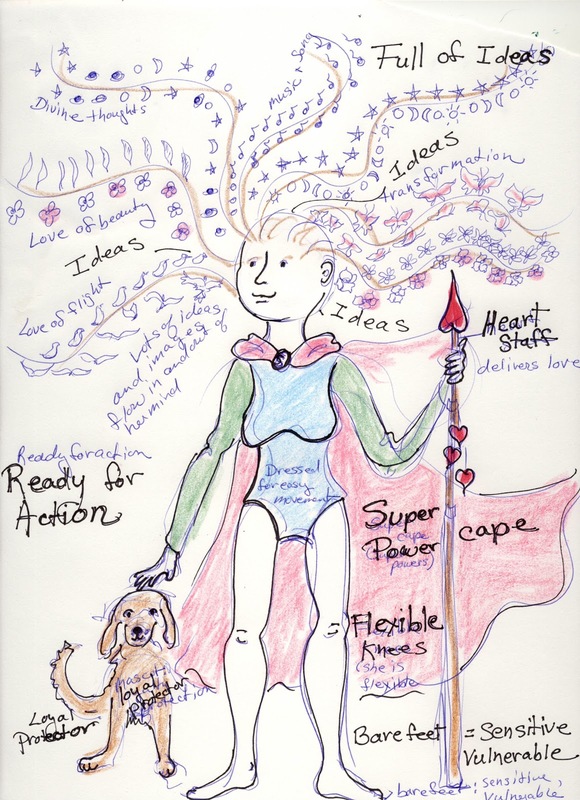 was heart tipped, or that her hair/head is flowing with ideas and images, but I was surprised to see the super cape-- and where did the dog come from?? I have been feeling very watched over lately. I mean when my car was totalled, I wasn't even scratched! A fraction of a second either way would have been disasterous! So may be that's where the dog protector came from; he is my guardian Angel. He puts me in mind of my beloved, who liked to think of himself as Bob-Dog. The very next day we had to identify our superpower. I think mine is the ability to connect with the good in people. I'll try to link to blog posts showing what my classmates have done with this assignment, as I become aware of them. Love your super woman! 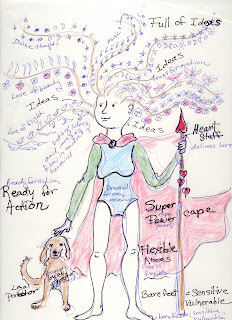 Super woman with angel dog. Can't beat that! Who is my business in service to?